It’s kind of funny that, although the weather has been a steady 100-degrees around here for the past week or so, I still decided to make a recipe that spends hours cooking in the oven. Hot? Yes. But they make your house smell amazing in the process. The only downfall? Having to wait four hours to eat them. Because they’re good. Really, really good. Your next BBQ needs these beans. Heck, your husband needs these beans. And I bet you’ll like them, too. Put the beans in a large bowl, cover with water, and let soak overnight. They’ll double in volume as they soak. In a large Dutch oven, cook the bacon over medium-high heat until lightly browned. Add the onions and cook until translucent. Add the tomato paste and cook for one minute. Add the rest of the ingredients (with the exception of the salt and pepper) raise the heat, and bring the beans to a slow boil. Then cover and cook in the oven for four hours, stirring two or three times during the cooking process. After four hours, remove the beans from the oven and season with salt and pepper to taste. These sound pretty frickin awesome! I hear the weather has cooled down a bit. Hope it holds out for my visit to the Chi next week! Ohhh! You’re coming to town? Fun! Both beer and bourbon? I’m in! 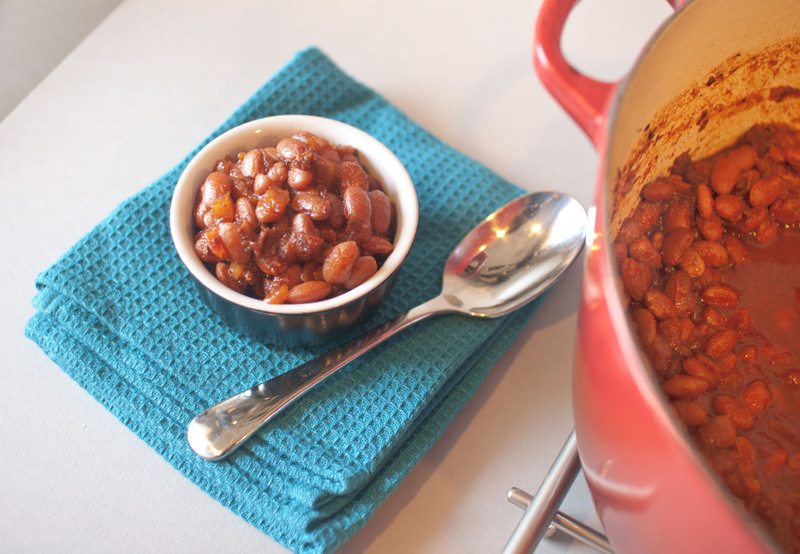 😉 I love baked beans too…and the homemade ones taste sooo much better than the canned stuff! Hey pretty lady, another mega selling point: coffee! That’s wicked! Love it! Mmmm! I’m definitely with your husband on the whole beans thing. I could eat ANY kind of beans, there’s just something about its modest specialness that I can’t quite put my finger on. This recipe though is taking things to a whole new level, it sounds like it’s got so many delicious layers of flavour which I can’t wait to try. i love my husband. i do. but if i made these beans… there wouldn’t be any left for him!